Could oil price fears be driving Moscow to play the role of spoiler? The signing of the Russian-Iranian Military Cooperation Agreement on January 20 has led to speculation, fuelled by rhetoric from Moscow and Tehran, that the two states are working to secure Iran from any future military intervention to stop its nuclear program whilst securing an economically hard-pressed Russia a lucrative market for its arms exports. Specifically, the Cooperation Agreement includes expanded cooperation against terrorism, exchanges of military personnel for training purposes, and an understanding enabling each country’s navy to use the other’s ports more frequently. 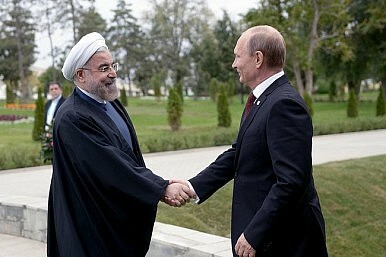 Further details are set to be agreed during a later visit by Vladimir Putin to Tehran. This agreement is the latest in a recent flurry of Russo-Iranian bilateral accords, including a Memorandum of Understanding (MoU) on the principles of trade and economic relations (signed on August 5, 2014) and a Joint Trade Commission meeting (September 7-11, 2014) at which both sides committed to increasing bilateral trade tenfold. This last factor is particularly important in supporting Russia’s efforts to diversify its imports in the face of Western sanctions. Finally, in November 2014 Russia and Iran signed an agreement regarding Russian participation in the construction of up to eight new nuclear power units throughout Iran. Russia and Iran also have a number of shared geopolitical interests in the greater Middle East, including combating Sunni extremism in Syria, Iraq and Afghanistan, and maintaining a stable governance regime in the Caspian Sea that excludes Western actors. There is, however, another angle through which this latest Russian overture can be assessed. With the relatively successful P5+1 negotiations of late 2014 due to resume in late February 2015, Russia must begin planning for a time when Iran re-enters the energy market as a full participant. To regain market share lost during the decades long sanctions regime Iran will need to dramatically increase production and begin aggressively sourcing new markets, all at a time of already rock-bottom oil prices. This is not an idle concern, Iran holds the world’s fourth-largest proven oil reserves and the world’s second-largest natural gas reserves (behind Russia). Russian energy exports are already under pressure over the short and medium terms from the shale gas revolution in the U.S. and the proliferation of LNG infrastructure across the EU, Russia’s most lucrative market. In reaction to this, Russia has followed up the decommissioning of the unaffordable South Stream project by putting in process a new “Turk Stream” pipeline. This will connect Russia gas producers to the southeast of Europe via an underwater link to a proposed pipeline corridor through Turkey. The pressure that Russia is putting on Turkey, Azerbaijan and the EU to make sure connecting infrastructure is in place by the time this pipeline is operational is indicative of the time pressure under which Moscow feels it is operating. With dramatic departmental budget cuts already taking place to accommodate the loss of revenue from falling energy prices the thought of a major new exporter further driving down prices, and thus government revenue, is cause for serious concern in the Kremlin. It is possible therefore, as first suggested by Brian Whitmore in his Daily Vertical podcast, to view Russian actions in Iran not as a way of shoring up relations with a major regional power but as a way of forestalling the upcoming P5+1 negotiations. Resuscitating the possibility that Russia may supply Iran with advanced air defense systems, primarily the S-300 or S-400 SAM systems, would represent a major impediment to the lifting of further sanctions on Iran. Whilst a Russian sale of these weapons would breach the sanctions regime agreed in 2010 the fact that Russia is now itself being targeted with Western sanctions may have altered the cost-benefit calculation in favor of going ahead with the deal. Such a solution also represents a rare coalescence among some of the main internal drivers of Russian foreign policy, in this instance the energy lobby led by the state-owned giants Rosneft and Gazprom, and the arms manufacturing lobby, currently preeminent and flush with cash due to Russia’s ruinously expensive military modernization program. This would form the latest in a recent trend of Russian “spoiler diplomacy,” whereby Russia acts through international institutions or negotiating formats to derail or block actions that are deemed detrimental to Russia’s national interest. This is the case in the UN Security Council over intervention in the Syrian civil war and in the east of Ukraine, where the strong Russian presence in the OSCE continually blocks the deployment of a meaningful international monitoring force. Prolonging the Iranian negotiations is also an opportunity for Russia to continue to present itself as an indispensable power in international relations. Whilst the conflict in Ukraine has caused a deepening rift between Russia and the West in Europe, areas of cooperation outside of this theater – including the long-term sustainability of the Afghan state, managing the disposal of Syrian chemical and biological weapons, Russo-American nuclear disarmament talks, and finally Iran – continue to provide the Kremlin with the international platform it feels is Russia’s due. Continued exclusion from the wider global community may also serve to make Tehran more amenable to Russian overtures to seek membership of the Shanghai Cooperation Organization (SCO), an increasingly important regional security infrastructure dominated by Russia and China. It may really be the case that Russia is simply trying to secure its post-sanctions relationship with Iran, but on a strategic level the normalization of Iranian international relations represents a serious threat to the Russian economic model and global diplomatic presence. Not for the first time, Russian overtures may not be quite what they seem. Thomas Frear is a Researcher at the European Leadership Network.